I wrote a review of the New Museum’s Urs Fischer show for More Intelligent Life, the sister publication of The Economist. The teaser below. Do grand gestures reduce to one-trick-pony-art in museums? 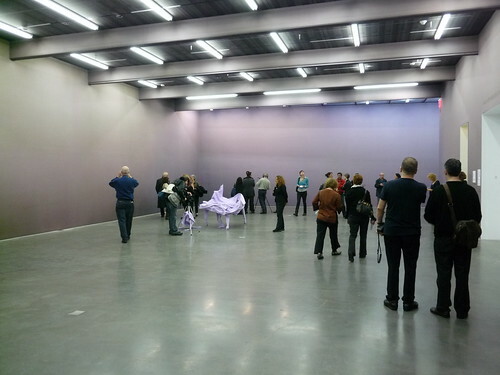 That's my concern about Urs Fischer's three floors of aluminium blobs, purple wallpaper, and silkscreened mirror boxes at the New Museum. Ambitious and vaguely compelling, most of the work looks far more polished than his famed holes in architectural foundations, though also more ambiguous. The exhibition title, “Marguerite de Ponty”, offers some interpretive clues to viewers. Named after the pseudonym of Stéphane Mallarmé, a French symbolist poet of the 19th century, Fischer's show references a movement that aimed to reveal absolute truths indirectly. Five giant aluminium replicas of small, squished mounds of clay on the fourth floor vaguely follow this logic; the change of material and scale monumentalises his casual touch (enormous fingerprints are visible). Yet the concept is dull, no matter how big and arresting the work. Better are the scattered companion sculptures on this floor, particularly a floppy pink aluminium light-post cast from a latex mould and a skeleton climbing cardboard boxes, both of which have an element of instability—of dynamism—absent in the larger “clay” pieces. completely agree. show was over-manufactured… and i cant imagine that aspect of the work to be justified by his intention. the lack of cohesion between actual physicality and the concept multiplied times 100 for scale= major disappointment. i guess this is more proof that throwing $$$ at a situation does not necessarily create a positive outcome.